For other ships with the same name, see USS Philadelphia. 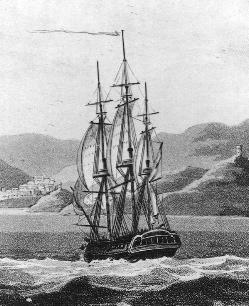 Putting to sea for duty in the West Indies to serve in the Quasi-War with France, she arrived on the Guadeloupe Station in May 1800 and relieved the frigate Constellation. During this cruise she captured five French armed vessels and recaptured six merchant ships that had fallen into French hands. Returning home in March 1801, she was ordered to prepare for a year's cruise in the Mediterranean in a squadron commanded by Commodore Richard Dale. At his own request, Decatur was relieved of the command of President by Captain Samuel Barron. The squadron arrived at Gibraltar on July 1, with Commodore Dale in the frigate President. Philadelphia was directed to cruise the Straits and blockade the coast of Tripoli, since in May 1801 the Pasha Yusuf Karamanli had threatened to wage war on the United States by chopping down the flagpole with the American flag before the U.S. consulate. Philadelphia departed Gibraltar for the United States in April 1802, arriving in mid-July. In ordinary until May 21, 1803, when she recommissioned (having her sixteen 9-pounder long guns replaced with sixteen 32-pounder carronades at this time), and sailed for the Mediterranean on July 28, 1803. She arrived in Gibraltar on August 24 with Captain William Bainbridge in command, and two days later recaptured the American brig Celia from the Moroccan ship-of-war Mirboka (24 guns and 100 men), and brought them both into Gibraltar. During the First Barbary War (1801–1805), Philadelphia cruised off Tripoli until October 31, 1803, while giving chase and firing upon a pirate ship she ran aground on an uncharted reef two miles off Tripoli Harbor. The captain, William Bainbridge, tried to refloat her, first laying the sails aback, and casting off three bow anchors and shifting the guns aftward. But a strong wind and rising waves drove her further aground. Next they jettisoned many of her cannons, barrels of water, and other heavy articles overboard in order to make her lighter, but this too failed. They then sawed off the foremast in one last desperate attempt to lighten her. All of these attempts failed and Bainbridge, in order not to resupply the pirates, ordered holes drilled in the ship's bottom, gunpowder dampened, sails set afire and all other weapons thrown overboard before surrendering. Her officers and men were made slaves of the Pasha (or Bashaw). Philadelphia, which had been refloated by her captors, was too great a prize to be allowed to remain in the hands of the Tripolitans, so a decision was made to recapture or destroy her. The U.S. had captured the Tripolitan ketch Mastico, renamed her Intrepid, and re-rigged the ship with short masts and triangular sails to look like a local ship. On February 16, 1804, under the cover of night and in the guise of a ship in distress that had lost all anchors in a storm and needed a place to tie up, Intrepid was sailed by a volunteer assaulting party of officers and men under Lieutenant Stephen Decatur, Jr. next to Philadelphia. The assault party boarded Philadelphia, and after making sure that she was not seaworthy, burned the ship where she lay in Tripoli Harbor. Lord Horatio Nelson, known as a man of action and bravery, is said to have called this "the most bold and daring act of the Age." "Preparation for War to defend Commerce ... the building of the Frigate Philadelphia," Birch's Views of Philadelphia (1800). Philadelphia in the harbor of Tripoli, February 16, 1804. (A) is the location of the wreck of Philadelphia at the time she was fired by Decatur. The dashed line is Decatur's route. (B) is the final resting place of Philadelphia after drifting and burning. Yusef Pashaw had equipped a number of corsairs.... His captains, Zurrig, Dghees, Trez, Romani and El-Mograbi, set sail from Tripoli and shortly sighted an American vessel [Philadelphia]. Zurrig left the others and daringly approached the ship, annoying her purposely to decoy her across the shoals. She stranded, but fired on the other vessels until her ammunition gave out, whereupon the Moslems pillaged her. The American Consul [actually the Danish consul, Nissen] was very much disheartened and tried to conclude arrangements similar to those recently made between the Bashaw and the Swedish Consul; but such an enormous tribute was demanded that no terms could be reached, so by order of the Bashaw the vessel was burned.... Footnote 2: This of course was an erroneous idea. It may have been purposefully circulated through the town, particularly among the inhabitants other than Mohammedans. Furlong later reports in the same book, that he talked to other Arabs in Tripoli who said that the ship was not burned, but moved to the Lazaretto where it was dressed up as a trophy and its guns used to call the end of Ramadan. According to the detailed account of Hadji-Mohammed Gabroom, an American ketch was able to sneak in, kill some of the 10 guards, cause the others to flee, then set the ship on fire. ^ Chapelle 1949, p. 549. ^ Canney, 2001, p. 52. ^ Toll, 2006, pp. 52–54. ^ Tucker, 1937, p. 17. ^ a b c "Philadelphia II". Dictionary of American Naval Fighting Ships. Navy Department, Naval History and Heritage Command. ^ Kilmeade & Yaeger, pp. 121–124. ^ Tucker, 1937, p. 57. ^ Papers Relating to the Foreign Relations of the United States (1873 - Part 1, Volume II ed.). Washington: Government Printing Office. December 1, 1873. p. 1140-1141. Retrieved February 16, 2018. ^ The Gateway to the Sahara: Observations and Experiences in Tripoli, by Charles Wellington Furlong. 1909. archive.org, accessed December 2017. ^ The Gateway to the Sahara: Observations and Experiences in Tripoli, by Charles Wellington Furlong. 1909. Page 104. archive.org, accessed December 2017. ^ The Gateway to the Sahara: Observations and Experiences in Tripoli, by Charles Wellington Furlong. 1909. pp. 106–12. archive.org, accessed December 2017. Mackenzie, Alexander Slidell (1846). Life of Stephen Decatur: a commodore in the Navy of the United States. C. C. Little and J. Brown, 1846. Kilmeade, Brian & Yaeger, Don (2015) Thomas Jefferson and the Tripoli Pirates: The Forgotten War That Changed American History. Sentinel., New York, ISBN 978-1-59184-806-6. Oren, Michael B. (2007) Power, Faith, and Fantasy, Chapter 3, W. W. Norton and Co., New York, ISBN 0-393-05826-3. Willis, Sam (2007). Fighting Ships: 1750–1850, Quercus Books, London. Zachs, Richard (2005). The Pirate Coast: Thomas Jefferson, the First Marines, and the Secret Mission of 1805, Hyperion, New York. This page was last edited on 27 February 2019, at 20:45 (UTC).